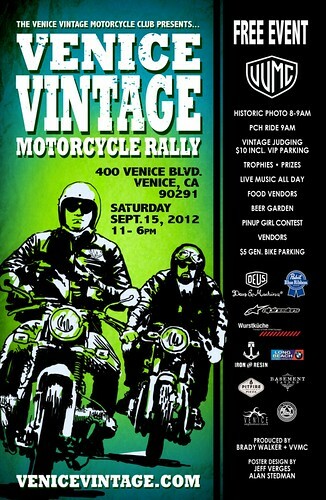 Venice Vintage Motorcycle Rally: Sept 15th - Yo! Venice! 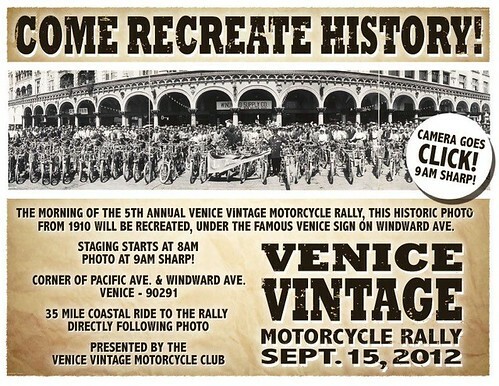 The 5th annual Venice Vintage Motorcycle Rally will be held on Saturday, September 15th, from 11am- 6pm at the Venice Farmers Market lot at 400 Venice Blvd. There will also be a photo recreation at 8 am and a ride up PCH at 9am! The festivities will include live music all day, food vendors, a beer garden, a pinup girl contest and industry vendors. As always, the event is free for spectators! Go check out the amazing vintage bikes!